An excellent noir aesthetic doesn't save Calvino Noir from its utterly incompetent and buggy gameplay, making for an infuriating stealth title. [T]here's a cynicism deep-rooted in Calvino Noir, a heavy darkness you can't escape. Death is always lurking, success is futile. Maybe this is the best representation of noire in games that nobody wanted. The game's "whodunnit" caper isn't the only mystery that needs solving in Calvino Noir. Some other design choices will leave folks scratching their heads. The greatest complaint I have here is movement -- characters move dreadfully, painfully slow. They're trying to be sneaky, and that's all very well and good, as it's a genuine way to stick to the stealth theme. However, when you die as much as you do in this game, playing through an area for the 3rd or 4th time at a slothlike pace becomes a bore, and a player will likely begin to question why they're putting themselves through this. When trying to move characters into hiding, they will sometimes move past the spot and shuffle around a bit before moving into place. Such side steps can be deadly. The game's "collectibles" present another puzzle. From time to time you will happen across money or other abandoned treasures while sneaking through gloomy hallways. This is fun at first, until you realize that said findings bear no discernible use. It's a strange loose end that makes the game feel a bit half-baked. 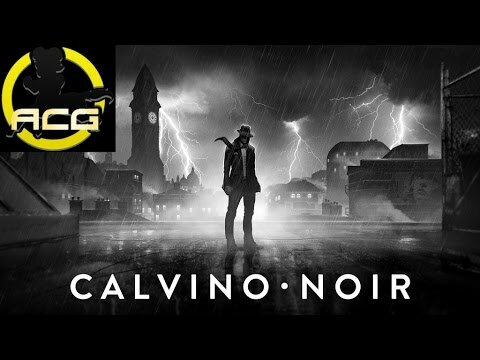 Calvino Noir cannot be saved by its mystery storyline or impressive graphics because it is just too flawed on a technical level.